What it’s about: Jurassic Park! While Michael Crichton’s dinosaur-DNA-in-amber scenario turns out to not be possible (even well-preserved DNA degrades beyond repair after a few million years), we actually do have the technology to bring back more recently extinct species like the passenger pigeon or the wooly mammoth. Within a few years, “going the way of the dodo” could be slang for a miraculous comeback. Biggest controversy: Your scientists were so preoccupied with whether or not they could, they didn’t stop to think if they should. Much like Jurassic Park, scientists are concerned that even if we can resurrect a species, we can’t re-create its original habitat or learned behavior, which could be detrimental to both the new animals and their new environment. There’s no telling if resurrected animals could become invasive species, wreaking havoc on an environment that’s been without them for centuries. Strangest fact: De-extinction could actually help fight climate change. One of the Earth’s biggest problem spots is Siberia, where millennia-old permafrost is beginning to thaw. 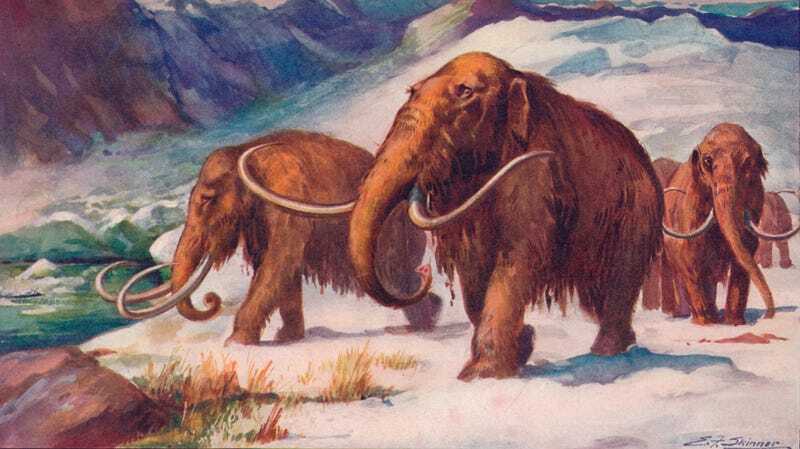 Restoring the region’s wooly mammoth population could help, as the animals eat dead grass, allowing new grass to grow more easily. They’d also crush layers of snow, which paradoxically would help keep the ground cold, as snow acts as a layer of insulation—in essence, it acts as a giant igloo for the ground. Thing we were happiest to learn: We have several ways of going about de-extinction. Cloning uses a preserved cell to create an embryo of the extinct animal, which would be carried to term by a similar species. Genome editing inserts missing DNA into a similar species’ genome, re-creating an animal with the same traits as the lost species (though, on a genetic level, not exactly the same species). Selective breeding is the least high-tech, but perhaps the most practical. When species go extinct, similar animals still contain much of the same DNA, so those animals can be bred to favor traits from the extinct animal—modern breeds of cattle could be cross-bred until their offspring resembles the auroch, a relative of the cow and bison that went extinct in 1627. Centuries ago, aurochs were domesticated into zebu cattle in India and taurine cattle in the Middle East, so those subspecies still carry many auroch traits and could be used to revive them. While the first two methods are largely theoretical, selective breeding has already been used to revive the quagga, a zebra variety that’s striped only on its head. As the new quagga are similar, but not directly related to the originals, they’re referred to as Rau quagga. Scientists now have their sights set on reviving an extinct tortoise originally discovered by Charles Darwin, Chelonoidis elephantopus. Thing we were unhappiest to learn: Not everything that comes back is friendly. The related list of resurrected species includes a few selectively bred animals, and two species that were thawed from Arctic ice after 30,000 years. One is Silene stenophylla, an Arctic wildflower. The other, more ominously, is Pithovirus sibericum, a giant virus that infects amoebae. While scientists dispute the idea that a thawed-out virus could create a pandemic, you can bet Roland Emmerich has a team of screenwriters working on the concept as we speak. Also noteworthy: De-extinction technologies can also help endangered species. Once a species’ population dips below a certain number, it’s impossible to sustain a healthy gene pool. But the same genetic engineering that can turn an existing species’ DNA into that of a long-lost relative, could also be used to broaden genetic diversity within a species. Also, just as an elephant could be made to give birth to a cloned wooly mammoth, a southern white rhinoceros (the least endangered rhino) could give birth to a cloned northern white (on the verge of extinction), bolstering the latter’s population. Best link to elsewhere on Wikipedia: There were once billions of passenger pigeons in North America, but between hunting and deforestation, it only took humans a few decades to drive them to extinction. The last bird died in captivity in 1914. The surviving passenger pigeon DNA on record is too degraded to clone new birds, but efforts are underway to genetically modify the band-tailed pigeon, the passenger’s closest living relative, to bring back the extinct birds. Revive & Restore, the non-profit behind the effort, claims its can produce birds for captive breeding by 2024, and create a wild population by 2030. Further down the Wormhole: For the second week in a row, we’re going back to Wikipedia’s Emerging Technologies tab, which includes the arcology. As SimCity 2000 players may remember, an arcology is a giant, self-contained city-within-a-city. They’re usually conceived as being completely sustainable, reusing resources within a closed ecosystem. There are a few arcologies on the list of visionary tall buildings and structures—we’ll hit the heights of some insanely ambitious, never-built skyscrapers next week.